CIPANGO offers a great amount of amenities for both private and charter use.CIPANGO represents a relatively high volume European motoryacht that has been updated from stem to stern. She offers four suites with two of them nearly identical master cabins, plus crew for four. United Yacht Sales New Jersey would love to guide you through a personal showing of this 97' Versilcraft Super Challenger 1992. 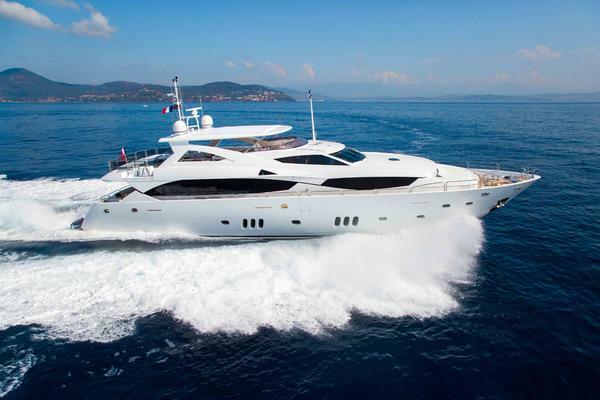 This yacht for sale is located in West Palm Beach, Florida and priced at $1,350,000. For a showing please contact us by filling out the form on this page and we will get back to you shortly! Master Stateroom Accessed via steps from the starboard side Companionway is the full beam Master Cabin. A king size berth off the forward bulkhead has an upholstered headboard set atop a cherry lattice work over mirrors. There are four large drawers beneath the berth. To both port and starboard are three drawer nightstands. Above each are inset gilded niches with twin lamp sconces. Six more dimmable halogen mini spots are above the bed. The port nightstand has a phone and a JVC AM/FM/CD player (new 2006). To port is a vanity with five burl wood drawers, un upholstered stool and a hinged top. Above the vanity is an opening stainless steel porthole with weather cover, full drapes and two halogen mini spots. At the foot of the berth is one double door auto lit hanging locker and two single door auto lit hanging lockers. The starboard locker has five shelves and a dressing mirror in addition to the hanging space. Between the hanging lockers is a 19" Hitachi TV, a Panasonic VCR/DVD combo, a hidden wall safe and a small "Tundra" drink refrigerator (new 2006) behind doors. To port is a two person settee flanked by twin chests of four drawers with table lamps above. Above the settee is an opening stainless steel porthole with weather cover on full drapes. Access to the private Head is found to starboard. Also in this cabin are eight additional halogen mini spots, digital AC controls, stereo speakers (new 2006) and a carpet runner. Master Head The Master Head is also full beam and impressive in size. Included in this area is a double vanity with four cabinet doors below, and twin under mount china sinks on an onyx countertop. There are two large mirrored medicine cabinet doors above. Besides a stall shower with bi fold door, seat, exhaust fan, hand held or wall mountable fixture, opening porthole with stainless steel cover, there is a full size Jacuzzi tub with an onyx surround, mirrored bulkhead and opening stainless steel porthole with weather cover above. Also in this area is a bidet, two heated towel racks, onyx tile sole and a Microphor toilet in a private area with lights, GFCI protected outlets, an exhaust fan and an opening stainless steel porthole with weather cover. VIP Head The VIP Head is also full beam and is just forward the VIP Cabin. There is a double vanity with four cabinet doors below and twin under mount china sinks in an onyx vanity top. Twin mirrored door medicine cabinets offer abundant storage. The shower has a bi fold door, seat, wall mounted or hand held shower fixture, an opening stainless steel porthole with weather cover, two halogen mini spots and an exhaust fan. Also in this area is a bidet and a private Microphor toilet with an opening stainless steel porthole with weather cover, two halogen mini spots, GFCI protected outlets and an exhaust fan. The sole is white marble tile, there are five halogen mini spots above the vanity and there are two heated towel racks.Starboard Guest Cabin The queen size berth is situated off the aft bulkhead. Four drawers below the berth offer storage. The upholstered headboard sits upon a five panel fully mirrored aft bulkhead. Twin three drawer nightstand with dual fixture sconce lights flank the berth. Overhead are five halogen mini spots and digital AC controls for the (new 2006) air handler. Outboard is an opening stainless steel porthole with weather cover and full drapes. A small vanity with stool and dressing mirror are next forward. A double door mirrored hanging locker with auto light also reveals a Samsung 17" LCD TV and a Jwinn DVD player.Starboard Guest Cabin Head The private Head for the Starboard Guest Cabin has a vanity with two cabinet doors below and a china under mount sink on the marble countertop. A Microphor toilet and bidet are below two sliding mirrored door storage cabinets with an opening stainless steel porthole with weather cover above. A retractable shade covers the porthole. The stall shower has a bi fold door, a seat, a hand held or wall mountable fixture, an exhaust fan and a light. Also in this area is a marble tile sole to match the countertop, GFCI protected outlets and four halogen mini spots for lighting. Port Guest Cabin The Port Guest Cabin has twin single berths with two drawers each under the berth. Upholstered headboards sit upon a fully mirrored aft deck bulkhead. Between the berths is a two drawer nightstand with a phone and a JVC AM/FM/CD player. Above is a wall mounted sconce.Above the outboard berth are two inset storage areas, an opening stainless steel porthole with weather cover and full drapes. Next forward is a an auto lit hanging locker with a mirrored exterior. Also in this cabin are (new) digital AC controls, five overhead halogen mini spots, stereo speakers, a carpet runner and access to a private head. Port Guest Head The Port Guest Head is compact but offers everything anyone would need. This includes a vanity with two cabinet doors below an under mount china sink in a marble countertop, medicine cabinet, GFCI protected outlets, opening porthole with stainless steel weather cover, toilet, exhaust fan and three lights. The stall shower has a bi fold glass door and a hand held or wall mounted shower fixture. The sole of the Head is a marble tiles to match the countertop. Hidden from view is a new (2006) hot water heater which services both aft cabins. Captains CabinForward to starboard is the Captain's Cabin with two single berths in an over/under arrangement reading lights, digital AC controls, opening stainless steel porthole with weather cover, bookshelves, JVC AM/FM/CD, a hanging locker with four drawers below, a full size dressing mirror and three very large storage cabinets plus four additional drawers under the berth. The private Head has a sink, Microphor toilet, medicine cabinet GFCI protected outlets and curtain shower. There is an exhaust fan, two overhead halogen mini spots and an opening stainless steel porthole with weather cover.Crew QuartersThe second cabin is nearly identical with two single bunks with four drawers below the lower bunk and an opening stainless steel porthole with weather cover above the upper bunk. A hanging locker with four drawers is aft of the bunks. Also in this cabin is a Jensen AM/FM/CD (new 2006), reading lights, AC controls and bookshelves. The private Head has a Microphor toilet, sink, medicine cabinet, two opening stainless steel portholes with weather covers, two door vanity, GFCI protected outlets, additional storage and a curtain shower plus a huge hatch with skylight. Entry to the Crew Head is via a doggable watertight door (rebuilt 2006). CIPANGO offers a great amount of amenities for both private and charter use. The spacious and inviting Aft Deck has walk around side decks up to the seating and sun lounge forward. The open plan Salon and Dining Salon creates a vast interior space. The raised Pilothouse offers the captain a commanding all weather Helm, a Day Head, larger than normal Galley and access to the Crew Cabins are further forward. The Master and nearly identical VIP Cabin has a private stair forward of the Dining Salon. The Queen and Twin Staterooms are accessed by separate stair in the Aft Salon. A great Flybridge with separate guest seating areas is accessed via the Pilothouse.Salon Entering via a pneumatic sliding door, the spacious Salon extends well forward and includes the adjacent Dining Salon. Immediately to starboard is a built in upholstered L shaped settee to seat six. Two small cherry and black galaxy granite tables lie in front of the sofa. Next forward is the Salon's entertainment center. It includes: Sony CD/DVD player DVP N5625P Sony Hi Fi stereo VCR SLV N77 Sony digital audio/video control center STR DE895 Pioneer Elite 300 disc CD/DVD player DV F07 RSQ video CD player for Karaoke SR222 Above the entertainment center is a gilded twin fixture wall sconce set upon a mirrored bulkhead. Next forward is a walk behind burl wood bar with a cube type refrigerator, Icerette icemaker, stainless bar sink, three cabinets, four drawers and a granite work surface. To port starting forward is a burl wood topped buffet. Next aft is an L shaped free standing sofa facing aft to seat three or four. The upholstery matches that of the aft sofa and there is a matching small table as well. Opposite the entertainment center are three burl wood drawers and a mirrored panel with gilded sconce light matches that to starboard. Next aft is a burl wood table with four loose chairs ideal for card games or cocktails. Furthest aft is an L-shaped cabinet hiding the steps to the aft accommodations and the Engine Room. Facing the aft settee mounted on the cabinet is a 32" Sony LCD TV. Overhead the Salon has a shallow tray type treatment with a mirrored border on vinyl panels. Seventeen halogen mini spots are arranged over the sofas, bars and tables. Drapes and opaque blinds cover the fixed and opening windows. Burl wood valances are lit from behind. Full drapes cover the aft sliding door and fixed clear side panel. Specially lit artwork in gilded frames, and custom woven carpet complete the high end décor of the Salon. Dining Salon Just forward but open to the Salon is the Dining Salon. The aforementioned buffet houses pegged dinnerware and padded glassware storage in three cabinet doors. Six more cabinets going forward house additional storage. The forward bulkhead has five more cabins with four additional to starboard. All of the storage cabinets have burl wood doors and tops. They completely surround the burl wood dining table that seats six to eight, offering storage not usually found on yachts of this size. The ceiling treatment has a deep tray with twelve halogen mini spots providing ample lighting. Additionally the forward bulkhead is mirrored and has two gilded sconce lights mounted on the mirror. Companionway To starboard from the Dining Salon is the yacht's main deck Companionway. From this area are nine curved steps to the Master and VIP Cabins, access to the Pilothouse, access to the large "Dog House" storage under the Pilothouse, access to the Day Head, the Galley and furthest forward the Crew Area. The Yacht's Day Head has a marble sole that matches the marble vanity top with under mount china sink. There are two cabinets in the vanity and a Microphor toilet. Two large ornate mirrors make the area seem larger than it actually is.